Traveling throughout Northern California as a group is easier with the Capitol Corridor. Groups of 20 or more can enjoy day-trips or multi-day excursions and see all the beauty, wonder, and excitement that the region has to offer. To ensure the successful planning of your upcoming trip, Group Travel Requests must be made at least 21 days in advance. If this is your first time as a Group Leader, take a look at our Group Leader Guide to make sure your group stays on track. Which Group Travel Program is Right for You? 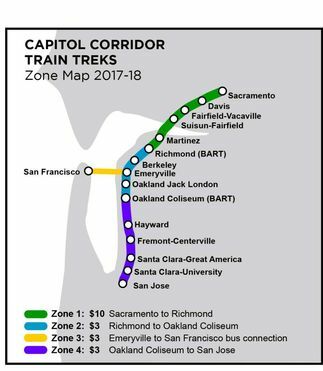 Capitol Corridor’s Train Treks program offers discounted train travel for school and youth groups (K-12). Make a ride on the Capitol Corridor part of your annual curriculum. Whether you’re planning your next team builder, office retreat or convention, Capitol Corridor’s Business Groups Program offers discounted travel packages as well as the ability to collaborate in motion. Families, friends and more can maximize their time together while saving on travel cost through Capitol Corridor’s Social Groups Program. Groups under 20 should visit our current promotions section for valid offers, including our Friends & Family discount that offers 50% off on up to five companion fares! Ride the Capitol Corridor on your next school field trip! Take the learning experience beyond the classroom and provide students with an opportunity to get up close and personal with top Northern California sites and destinations all made possible by the convenience of traveling by rail. Capitol Corridor’s Train Treks program offers discounted train travel for schools and youth groups of 20 or more through Grade 12, with roundtrip fares ranging from just $3 to $19! Group Travel Requests must be made at least 21 days in advance. Chaperones: To help plan your trip, the Group Leader Guide will make sure your group has a successful trip. Train Treks is a youth first program and Chaperones are required for each group. The required minimum is 1 chaperone per 6 students, and the number of chaperones may be equal to, but not exceed the number of students. Pricing and contents subject to change without notice. Groups under 50 are welcome to visit the Café Car, which offers a variety of snacks, meals and beverages. The roundtrip cost per person (adult chaperone and youth) to travel to and from stations within each zone is based upon the demand for travel segments. Groups are not allowed to travel onboard trains between Auburn and Sacramento. Train travel is the perfect setting for collaboration, networking or simply building rapport amongst your team. While away from the office, teams can still maximize their productivity with onboard amenities such as the free Wi-Fi, power outlets, and food and beverage service. Business Groups of 20 or more can take advantage of a 50% discount on full fare ticket prices. Group Travel Requests must be made at least 21 days in advance. Make your trip about more than just the destination, and make the trip there just as fun by traveling as a group. For years, Capitol Corridor has hosted groups such as the Red Hatters, church groups and Rotary Clubs get everywhere from the State Capital, sporting events, to Fisherman’s Wharf. While aboard the train, you and your group can play games, enjoy casual conversation, dine, or simply relax until you get to your final destination. Social Groups of 20 or more can take advantage of a 50% discount on full fare ticket prices. Group Travel Requests must be made at least 21 days in advance. Reserve your group today!